The Wolff-Parkinson-White syndrome describes the presence of an accessory pathway connecting the atria with the ventricles which is associated to tachyarrhythmias. By custom, it is also referred as Wolff-Parkinson-White syndrome the discovery of pre-excitation electrocardiographic signs secondary to the existence of this accessory pathway, even when there is no medical history of tachycardia or palpitations. Patients diagnosed with Wolff-Parkinson-White syndrome usually have a slightly higher risk of suffering sudden cardiac death compared to healthy population, although this depends on the accessory pathway characteristics. As we discussed, the anatomical substrate of this pathology is the presence of an accessory pathway (bundle of Kent) that electrically connects the atria with the ventricles. This allows a second path for the electrical impulse. 2. Accessory pathway (bundle of Kent). The bundle of Kent is usually formed by normal myocardial fibers and does not have the physiological delay of the AV node, so part of the ventricular myocardium is depolarized through it ahead of the conduction system. Clinical and electrocardiographic manifestations of the Wolff-Parkinson-White syndrome will depend of the pathway characteristics — conduction direction (anterograde, retrograde or bidirectional conduction) and conduction velocity. Classic Wolff-Parkinson-White syndrome EKG shows the electrocardiographic signs of pre-excitation. As the stimulus originates from the sinus node, the P wave will be normal. In pre-excitation, ventricles depolarize from two different points: bundle of His and the accessory pathway. Usually the depolarization via accessory pathway is faster, so the PR interval shortens and a Delta wave appears at the beginning of the QRS complex, causing its widening. When a high degree of pre-excitation is present — more conduction through the accessory pathway than through the normal conduction system — the QRS complex morphology turns into that of bundle branch blocks, being widened. Alterations of the ST segment and inverted T waves also appear. Sinus P wave, except alterations. Shortened PR interval (less than 0,12 s). Widened QRS complex, due to the presence of the Delta wave. With high degree of pre-excitation, the QRS complex is similar to a bundle branch blocks pattern and alterations of repolarization may be observed. The degree of pre-excitation often presents variations: it can differ between two different electrocardiograms or even in the same EKG. Conduction velocity of the accessory pathway is what determines the degree of pre-excitation. In higher degree of pre-excitation, the Delta wave is more accentuated, the QRS complex is wider, and the repolarization disorders appear. EKG showing sinus beats alternating with pre-excitation beats (short PR interval, wide QRS complex, and negative T wave). When the pathway presents retrograde-only conduction (from ventricle to atrium) it is still capable of causing orthodromic atrioventricular reentry tachycardia (see below). However, as there is no conduction from the atria to the ventricles the characteristic alterations of pre-excitation are not seen, therefore presenting a normal sinus rhythm electrocardiogram. For this reason, this is termed “concealed” accessory pathway, because it cannot be diagnosed with a sinus rhythm electrocardiogram. In Wolff-Parkinson-White syndrome, there is a macro-circuit formed by the atria, the conduction system, the ventricles and the accessory pathway. 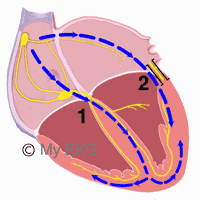 Atrioventricular reentry tachycardias can ensue through this circuit. Narrow QRS complex tachycardia, without pre-excitation sings. retrograde P waves in red. The most frequent one in Wolff-Parkinson-White syndrome. The electrical stimulus goes from the atria to the ventricles through the normal conduction system and returns through the accessory pathway. Narrow QRS tachycardia morphology (if no other alterations are present), no pre-excitation signs are observed. The stimulus goes from the atria to the ventricles through the accessory pathway and returns through the normal conduction system. Wide QRS rhythmical tachycardia morphology (making it hard to distinguish from ventricular tachycardia) due to QRS complexes presenting maximum pre-excitation. Tachyarrhythmias generated in the atria with no relation to Wolff-Parkinson-White syndrome (atrial fibrillation, atrial flutter or atrial Tachycardia), transmitted to the ventricles through the accessory pathway. As the pathway lacks the slow conductions properties of the AV node, this can cause critically elevated ventricular frequencies and ensue ventricular fibrillation. Its diagnosis has been abandoned as its mechanism has not been electrophysiologically confirmed. At present, it is advisable not to use it as diagnosis. The Lown-Ganong-Levinge syndrome was described in 1952 and has historically been considered secondary to an accessory pathway connecting the atria with the distal part of the atrioventricular node. This causes the stimulus to skip the physiological delay of the AV node and stimulate the bundle of His at an early stage, continuing to the ventricles through the normal conduction system. In short, the characteristic finding on the Lown-Ganong-Levine electrocardiogram is a short PR interval, with no other alterations.